Hydraulic Oil Machine – Emactra Machine Industries India is a leading manufacturers and exporters of industrial presses. Solid particle pollution in oil is the main reason for the Hydraulic system failure. In order to meet hydraulic high Performance, high reliability and long-lived development, Company. The kind portable filter system are Made into good structure, easy using and maintenance, high dirt-holding capacity of fine filter and soon. Customers can choose the fine filter with suitable filtration accuracy class according to their filtering requirement. 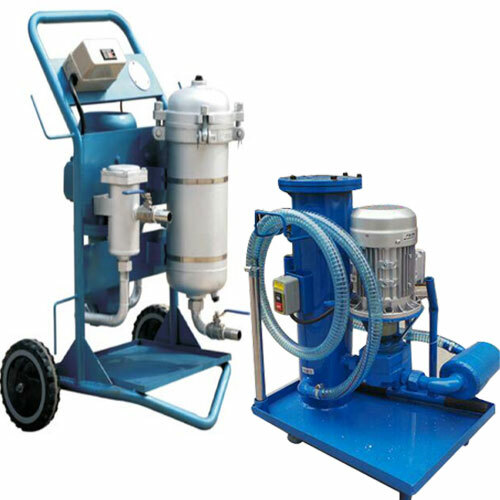 (1,3,5,10,20,30) Portable filter carts not only can be used as hydraulic system tanker to ensure the cleanliness of oil, but portable filter machine also used as by-pass circulation filtering equipment of the hydraulic system for regular cleanliness. The portable filter carts can be maintain the pollution of hydraulic system keep the system work properly, and prolong the service life. Filtering new fluid before putting into service. Transferring fluid from drums or storage tanks to system reservoirs. Conditioning fluid that is already in use. Removing free and emulsified water from a system. For use with fluids such as hydraulic, gear and lube oils.